With more 1 cup coffee makers than ever before, its time to extend my original examination of coffee pod machines, with some of the best single cup coffee makers to match both lifestyle & your budget. Because of its versatility, coffee isn’t enjoyed by everyone the same way. For many, it’s a pick-me-up on their way to work; for others, it’s a nice way to cap off a good meal with friends. Just as there are many ways to enjoy coffee, there are plenty of ways to brew it, too. Traditional types of espresso machine make use of a large, 12-cup carafe, but in today’s modern world, consumption has shifted. Instead of making a full pot and pouring half out, we now make it as we need it, and with the advent of the single cup coffee maker, it’s never been easier to enjoy one cup of coffee at a time, at your convenience. 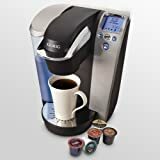 With over 900 five star reviews on Amazon we regard the Keurig K60/65 special edition as the best single serve coffee maker under $200. Keurig coffee makers have single-handedly (or single “cuppedly” as the case may be) changed the way people drink coffee today. Everywhere you look you’ll find their K-cups in favorite coffee flavors as well as hot cocoa varieties, apple cider, hot tea, and iced tea flavours. When you buy a Keurig device, you’re purchasing so much more than a mere coffee maker. The real claim to fame for the Keurig brand is the fact that it is simple to use and even easier to clean up after using. For those who have favorite beans or coffee flavors there are also filters available that can be used in place of the k-cups. In other words, Keurig has pretty much every coffee drinker covered. 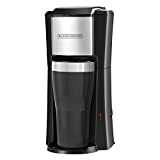 The Keurig Special Edition K60/65 coffee maker is definitely one of the best single serve coffee makers on the market. It offers a large 60 oz reservoir for storing extra water. Those who stumble to the coffee pot in the morning and find it difficult enough to press the start button can truly appreciate the large reservoir (one less thing to deal with in the morning). It also comes with a removable drip tray that is very easy to clean. It takes just 15 seconds to heat water between serves on this single serve coffee maker! It has a stylish blue, backlit display with 3 options for brew size. It also comes with an adjustable temperature control and a digital clock. The VertuoLine Evoluo from Nespresso combines both freshly brewed coffee and espresso-making into one, easy-to-use and beautiful one cup coffee maker. Bolstered by its patented Centrifusion technology, the Evoluo sets out to create something beautiful in every cup. Utilizing a unique barcode technology, each pod is brewed differently with just the touch of a button. It’s also incredibly fast and can heat up in as little as 15-20 seconds for convenient, yet delicious coffee and espresso. After 9 minutes of non-use, the machine automatically turns off, conserving energy. With a 54 oz. water tank and 5 cup positions, it’s just as good at making a few cups as it is at making a one. 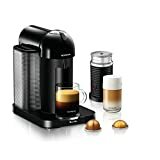 We regard the VertuoLine Evoluo from Nespresso as one of the best single serve coffee makers under $200. When it comes to the Senseo brand of single serve coffee brewing systems. The Senseo 7810 Gourmet coffee machine is well-liked by consumers. It offers a one-touch brewing system, a removable water reservoir, and two pod filters for holding the pre-measured Senseo pods. The adjustable water spout can accommodate multiple cup sizes, and a programmable and interactive LCD screen assists you in brewing your perfect cup of coffee each and every time. Removable parts are dishwasher safe and the machine offers a small countertop footprint for easy storage and/or display. The sleek modern design is unobtrusive in most kitchens and the machine is well-suited for heavy-duty coffee drinking families. The Senseo coffee maker does create a sensational tasting coffee, complete with a good crema, using pods. It only takes 90 seconds or so to heat the water to temperature. When it’s ready to go, push a button and your coffee is poured for you. We all lead busy lifestyles and the last thing we want is to be chained to the kitchen trying to clean all the bits and pieces of a complex device such as a coffee maker. The Senseo coffee maker takes the hassle out of cleaning for you. They have made it easy with all the removable parts being dishwasher safe. If you’re on the hunt for the best single serve coffee maker, you know there are many that strive to be great but just miss the mark. If it’s the top quality you’re after, look no further than the Francis Francis Y5 Iperespresso from Illy’. The Italian coffee giant is known for its innovation and the Y5 is all the proof you need. With a sophisticated, modern design, the Y5 not only looks good, but it performs well, too. With the ability to make amazing cups of both coffee and espresso, the Iperespresso machine is adaptable and perfect for any kitchen. Though the inclusion of a 30 oz. water tank may be deceiving, it’s actually a small, compact machine that fits on any countertop. And with its components each accessible from the front, it leaves you all the room you could ever need. For many, a single brew coffee maker means compact with limited functionality. For Ninja, it means a machine that makes that one cup of coffee as good as it can be. They do exactly that with their CF091 Coffee Bar Brewer System. Unlike other single cup machines, the Coffee Bar brings out the barista in everyone who uses it. With 5 different brew types, a built-in hot and cold frother and 6 different brew sizes, it’s so easy to create a customized cup of coffee just for you. It’s not just limited to a hot cup of joe, either; the CF091 is also designed to brew fresh and hot over ice for a coffee that never tastes watered down. If you’ve ever checked out the coffee machines in a coffee shop or café, odds are you’ve come across a BUNN maker before. And just like those coffee shops, you can make café quality coffee in your home with the MCU single cup home coffee brewer from BUNN. Small and discreet, the MCU is stylish and minimalistic in design but brews a single cup of coffee like its professional-grade counterparts. With a range of 4 to 14 ounces, ready in under a minute, BUNN’s Pulse Brew technology optimizes each K-Cup to extract bold, rich flavours. But if you’d prefer to brew your own grounds, it can do that, too; even loose tea and tea bags. The single serve coffee maker has been on the market for some time now, but it was Keurig who arguably put it on the map. Each Keurig coffee maker features a sleek and modern design and this still rings true for the Keurig B-70. It’s been popular for a long time now which is always a good sign in my book. This machine offers an easy to read LCD display that is backlit in blue. It has a clock and is programmable so that you can follow your nose to the coffee maker in the morning without needing to open your eyes. You can even customize the device to your own preferred brew temperature. The water reservoir on this device is also backlit in blue so that you know when it’s time to refill and there is on onboard de-scale indicator to let you know when this critical task is necessary. Keurig have designed their single-cup coffee makers to be very user-friendly. Push a button and the water will heat up in just minutes. When it’s done, a light will let you know when you can push another button to pour your perfect coffee. Another really great thing about Keurig coffee makers is how easy it is to clean up after making your cup of coffee. The k-cups snap out with the press of a button and can be thrown away without spilling wet coffee grounds everywhere. The drip cup is removable and can be placed in the dishwasher. De-scaling is occasionally necessary but there are kits available that make this process a snap as well. Not every coffee lover is in need of the latest, greatest model. For many, convenience is the name of the game and a fast, reliable single cup coffee maker is all that’s required. For those who want a stripped down, affordable 1 cup coffee maker, Hamilton Beach’s 49981A model is everything they need and more. 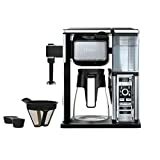 Named “Amazon’s Choice” for the best single serve coffee maker, the 49981A features a durable, stainless steel design, built with single cups and travel mugs in mind. Brew your own coffee grounds with its single serve scoop filter and do away with the waste of single-use coffee pods and capsules. Keurig has come a long way since its introduction into the market of single cup coffee makers. With dozens of new and different models, its success has always been about making a convenient, quality cup of coffee, even for those who aren’t coffee savvy. Keurig had those in mind when it created the Keurig K55, their straightforward and classic single cup maker design. With programmable settings and a 48 ox water reservoir, there’s no limit to when you make your coffee; refills are few and all it takes is the press of a button to brew in minutes. The descaling feature also means that the machine stays clean so your coffee tastes great every time. And with an auto-off mechanism, you can be sure you’re conserving energy, even if you forget to turn off the coffee maker when you’re done brewing. Like the Hamilton Beach 49981A, the CM618 from Black + Decker is designed for on-the-go coffee and single cups at your convenience. Compact and personal, the CM618 features a space-saving design in stainless steel and black that already includes a travel mug; all you have to do is brew and go. With a permanent grounds filter, there’s no need to buy wasteful pods or even paper filters for a great cup of coffee every day. Automatic shutoff also means that if you forget to turn off your machine as you’re running out the door, there’s no need to worry about wasting energy. The best espresso maker means something different to everyone, but we can all agree that quality beats quantity any day. Whether you’re sipping it on your morning commute or brewing the perfect afternoon cup for you and your guests, the importance of brew quality makes the difference between an enjoyable coffee experience and a lacklustre one, even if it’s just one cup. To make every drink an amazing one, try out any one of these coffee pod machines and decide for yourself which takes the cake as the best single cup coffee maker.